This was the last budget of BJP govt before the next elections and it was expected that they would announce some very good changes in budget which will be for middle class. From last many years, the tax slab rates have not seen any major changes (except few small changes) . The 80C limit and housing loan interest deducted limits were revised few years back, but still the common man expected some really good news. While the budget was very good for farmers and rural sectors in general and also for senior citizens, it was extremely disappointing for middle class who are mainly into jobs. 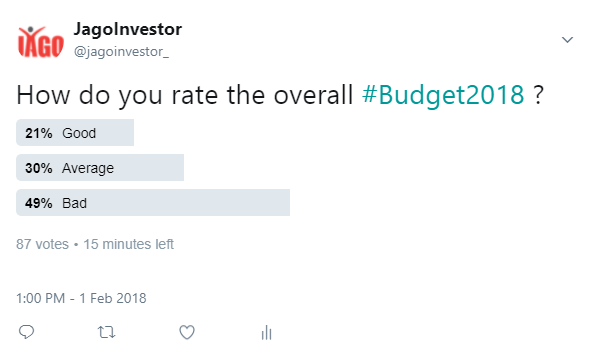 On twitter, I asked about people opinion on the budget and as expected, most of the people were not happy about it. One of the biggest disappointments for everyone in this budget was that the tax slabs were not changed at all. In media we keep hearing on how the minimum limit for taxation should be raised from 2.5 lacs to 5 lacs, but it was not even raised to 3 lacs. So you will still pay the taxes as per old slab rates only. There is a standard deduction of Rs 40,000 allowed in this budget, which means that you can now reduce your taxable salary by Rs 40,000 directly along with other deductions and benefits. But this only looks great on paper, because the transport allowance of Rs 19,200 and medical reimbursement of Rs 15,000 are now removed as benefits. So earlier anyways one was able to claim around Rs 34,200 ,so the added advantage is only for Rs 5,800 more. The biggest news in this budget was the reintroduction of 10% tax on long term capital gains on equity without Indexation benefits. Let me touch base on this a bit as this is very important to understand, however I will make another details article soon on this. Till now, if you held equity stocks or equity mutual funds for more than 1 yr, then all the profits you made were tax free when you sold them. However now you will have to pay 10% tax on the profits on profits above Rs 1 lac. However this will only apply on the profits made after 31st Jan 2018 and if you sell your holdings after 31st Mar 2018. All the gains you have made till 31st Jan 2018, are protected and now they will be considered as your cost price. So if you had bought a stock or equity mutual funds for Rs 1 lacs in May 2017, and its value on 31st Jan 2018 was 1.2 lacs, then you do not pay any tax on this profit of Rs 20,000 . Now your cost price will become 1.2 lacs . Now if you sell it in let’s say Dec 2018 for Rs 1.5 lacs , then your capital gains will be 1.5 lacs – 1.2 lacs = Rs 30,000 (not 50k). Note that the capital tax gains will come into picture only when you sell your holdings and the tax will be applicable only on the profits above Rs 1 lac. Capital gains on equity was already there before 2004, At that time it was 20% on profits with indexation or 10% without indexation. Now they are reintroduced. Note that if you sell your holdings before 31st March 2018, the old rules still apply. This new rules are only going to be in picture if you sell after 1st April, 2018. Dont get too emotional about the tax part. I know people hate paying tax in any form, and especially when it comes as a surprise. But the truth is that the capital gains tax was there before 2004. Its not reintroduced. You should feel happy that for 13 yrs, there was no taxes on equity gains and those of you who have made great returns in past decade enjoyed it tax free. Also, the capital gains tax on equity is one of the lowest in India at 10% . Most of the other countries tax it at anywhere from 15-35% . So we are not in bad shape. For example, if the company announces Rs 10 dividend per share/unit and you are suppose to get Rs 10,000 dividend , then you will get Rs 9,000 and Rs 1,000 will be paid to govt directly by the company. This applies to both dividend and dividend reinvestment option in mutual funds. The dividend distribution tax and treatment for debt mutual funds is still the same. No changes in that. The cess was increased from 3% to 4% in this budget. Cess is something which you pay extra on the income tax. So if you are in 20% income tax bracket, then you will pay 4% more on 20% , which will make your income tax rate as 20.8% . If your income tax amount comes to Rs 20,000 per year, then your cess will be 4% of Rs 20,000 = Rs 800. With 1% increase in cess, you will pay Rs 200 more now (if your income tax is 20,000). This will increase your tax burden by a very marginal amount. This budget has given a lot of benefits for senior citizens. One big benefit is that now there won’t be any tax on interest on all the deposits and bank interest up to Rs 50,000 for senior citizens. This will include interest of saving bank account, fixed deposits and recurring deposits. Now there won’t be any TDS deductions for interest from deposits (fixed deposits and recurring deposits) upto Rs 50,000. Till now the TDS was deducted as per provisions of section 194A , if the interest was above Rs 10,000 , but now it will be Rs 50,000 limit. Under section 80D, there was an exemption of up to 30,000 per year for health insurance premiums for senior citizens, but now it has been increased up to Rs 50,000 . It’s a major relief because for senior citizens the health insurance premiums are very high and in most cases, it’s more than 40-50k anyways. There is an increase in the deduction limit for medical expenditure for certain illness up to Rs 1 lac for all senior citizens under section 80DDB . So in a particular year, if a senior citizen spends money on treatment of these illness, they can claim deduction on up to Rs 1 lac. Those of you who are running any companies, the good news is that the tax rate will be 25% now instead of 30%, provided your turnover is less than Rs 250 crores yearly. Now all the new women how will join the workforce for the first time, their EPF will be deducted @8% only instead of 12% for the first 3 yrs, also the govt will now provide 12% from their side also. It’s still not clear if the employer contribution will also be extra other than govt contribution. Another big news was that now govt is bringing a health insurance scheme for masses, where each family will be entitled for Rs 5 lac sum assured each year. But this will be mostly for weaker section of society and I don’t think any of our readers will be eligible for this. There are no details about this scheme right now in budget and no allocations is made for this. I would rather wait for more details before commenting on this more. However if successfully implemented it would be wonderful for our country. Let us know what do you think about the budget? What is one major disappointment and one great thing about the budget for you? Really Awesome post.. Hats off for your work.. Thanks !!! Thanks for your comment Atellier .. Please keep sharing your views like this.. Thanks for your comment Prajakta .. Please keep sharing your views like this.. Thanks for your comment Salim .. Please keep sharing your views like this..
Nice Analysis…We are waiting for the budget which is middle class focused… lets see any govt. turn eye towards taxation reform of salaried class.. Thanks for your comment Super Multibaggers .. Please keep sharing your views like this.. Thanks for all above info, and I read all your articles and blogs, they really just awesome. I agree may other countries are taking tax more however as a middle class man I am paying lot of taxes already to government even after this there is no developments happening and the changes that are happening are not reaching to actual people. This all because as every one know all politicians are corrupted and even many govt. officials as well. So even after paying these many taxes i am not getting the basic and fundamental facilities. In other countries the basic facilities are made reachable to common man but not in India. And want to confirm I am not anti Modiji Govt. too. More needs to be done from govt side .. and I think its happening .. The pace is slow and it will be. We can not see things changes in few months or even years. It takes decades ! Good you mentioned the last line…else you would have been branded as anti-nationlist !!! 1.CANCEL CANTEEN SUBSIDY WHERE POOR MP MLA ARE SERVED AT RATE WHICH EVEN A REAL POOR CAN FIND FOOD….really THEY DESERVE ??????? But in India they deserve. All amenities …..tax free income .really they are poor..????? Where the money is going ……..still middle man is affording the same …..petrol prices are left with market prices but why media do not criticise the move . 4.bjp always says Congress do not have right to say anything as they have not fine in past 55 years …. BUT I REALLY CONDEM THIS SAYING ……MR MANMOHAN SINGH IS GREAT LEADER …HE IS THE OUR NATION BUILDER ….BJP IS EATING THE FRUITS OF MR MANMOHAN SINGH ………BUT PROBLEM WAS MR MANMOHAN SINGH Did EVERTHING BY KEEPING SILENT …AND OUT MODI JI DOES NOT DO NYTHING EVEN BY YELLING …..
BHAYIO MAIN 1 SIR KE BADLE 10 SIR LAUNGA WHERE IS THAT 56 INCH SEENA …..WHATS HE HAS DONE ABOUT PAKISTAN STILL WE ARE LOOSING OUR SAINIK…. NOTHING ON THAT FRONT ..
5 I PERSONALLY FEEL AND SALUTE MR MANMOHAN SINGH WAS BEST PRIME MINISTER AND BRILLIANT FINANCE MINISTER IN 1993 DUE TO THAT WE ARE NOT SELLING PAKORA AND DOING JOBS IN MULTINATIONAL COMPANIES ..
8LAST BUT NOT LEAST MEDIA SHOULD PUBLISH ANALYSIS GOVERMENT REPORT EVERY QAUTTER ……..WHAT YOU PROMISED AND WHATS DONE ..SO THAT PEOPLE COULD KNOW WHAT IS DOING AAAPNI GOVERMENT FOR US….. Thanks for your comment Tarun kumatr .. Please keep sharing your views like this.. I do not know what system has been implemented to enable your blog, but is it possible for you to switch to a system which does not have too many indentation as on mobile it is impossible to write a reply to the third reply received by you. There may be a system which use unindented reply system with a show and hide. That would be easy to interact. Also could you have the Leave a Reply section directly underneath your blog, instead of having it at the end. Please take it as a constructive suggestion if thought deem fit. Thanks for the feedback, Yes – its one of the issues which I am aware about. Will try to fix it asap. But it will take some time. Thanks for your comment Shrenuj Jalan .. Please keep sharing your views like this.. This budget is more clear and beneficial for all categories. Govt. moves are perfect to create a solid base and stabilize the economy strongly. All earlier budgets or Govts had provided subsidies and wasted money. Neither able to control deficit nor manage the development. In this budget, though middle class has not received any thing, neither they are losing anything by any additional burden. Poor may get benefits. See Govt is trying to bring the poor in middle class segment sothat they shall cover under tax slab. In that case, deficit will be lowered and maximised tax collection. In current scenario, middle class is paying taxes honestly and benefits are given to all poors. Govt wants to improve this situation. Hence middle class public must control their feelings and support. So many years this class has faced only issues, few more may give long run benefits. The poor class currently, will also join middle class and burden will be shared. Then the power of this class can control higher class. That is the idealogy. Hence be cautious in 2019, else will have no option but to crawl life long. Keep eyes open, think how all oppositions are trying to form unity against this Govt to pull them down as their shops will close if poor class will join middle class. Best of luck. Thanks for your comment B Prashant .. Please keep sharing your views like this..
Don’t you forget BJP has also got its fair chance in the past, whereby they have failed miserably only due to their ideology. I am not too sure of economically backward class rising up to reach middle class but the fact is distinctly clear that middle class is merging to be economically backward from time to time, only it has not been recognised and publicised. Only fools can fall prey to rosy pictures painted by the gift of the gab; as it has been for 70 years. Very well writen article all who fantasise roses in thin air should read, be aware of, and sooner they accept realitu the better it is for India as a nation to keep its reapect intact. Only God can bless India from corrupt politicos. I really do not understand how economically backward class will move to middle class without creating earning opportunities for them, rather, just giving them freebies. While the petrol price, gas price increased which has a direct impact on all other commodities which will be priced higher, where do we see middle class going? is like saying, come here you are the “Bakra” and we wanna kill you; in a milder way. We are vegetarian man eating Indians. Has any one realised that GST which was expected to reduce prices and should have, has in reality increased prices of the day to day items we use. MEDICINE for one has become expensive by 10 to 15%, companies have increased MRP. Hotel and Restaurant bills have gone up as the base / menu price have been jacked up. The list can continue and will keep adding up. On the other hand business; startups, small, medium, and large establishments gets rebates and adjustments for taxes paid as expenses. Injustice practiced since 70 years and no one thinks or speaks about it. We should have an effective organisation to represent middle class in a much stronger manner and get this rectified without second thought and immediately we should demand either have income tax or expenditure tax. Both oops sorry Triple taxation is not only unfair but a criminal offence. It is killing and it is high time, we raise our voice effectively. It appears we live to work on calculating tax payable all year adhering to time limits to feed the paliamentarians as; as per tweet from financial secretary who claims GST revenue is used to pay military and defense of the country. Do you buy it? Imagine all the time you would save and use it efficiently to do progressive work instead, if all taxes were done away with and a very simple and very low flat percentage of tax payable say 5% one time at year end is made applicable. The nation would progress at a much higher rate . This would have huge tax collection as a result, instead all farmers benefits going to scrupulous elements mis-reporting agriculture income as their earnings. most of the politicos have farm lands which ever way it is possible for them to hold and use this loophole. Please ask him to elaborate and explain what are the other taxes, and as if that is not sufficient; surcharges and cess – education, swatch bharat cess etc which has achieved no purpose – the citys are not only dirty but filthier than before and gets worse day by day. If Govt thinks they need 5L monthly salary for themselves, then that should be the exemption limit 5 x 12 = 60 L for middle class. Ministers are in the field to “serve” the people. They want to get elected to serve you as they so say – they care for you. Then there is no question you ask for remuneration for that service and also make fast money with failed projects. Every failed budget proposals should be scrutinised and the ministry and ministers past and present should be punished severely for lapse, loss due to delay and increase in cost to nation for those projects. Budget is not only about proposal to spend (read make money) with future projects ( designed and crafted to pull the wool over people’s eyes) but also to account properly for the amount spent for the past projects; COMPLETED OR FAILED and explained. There should be proper audit firm ( combination of 5 large audit firms ) to audit and fairly report govt accounts and their finding on a quarter to quarter basis, as is the normal practise / regulation for large companies to we the people. Thanks for your comment Human being .. Please keep sharing your views like this..
Its Interest as a whole from all the bank deposits / saving banks . It will not help to distribute in various FD ! Interest income upto 50000 is tax free. Above that limit, it is taxable. If one has deposits in same bank, the bank can track and deduct TDS if interest income crosses the limit. (This also I am doubtful, as normally savings bank income does not go for TDS). If one has deposits in various banks, each bank cannot track the total interest income and make TDS. However, the responsibility lies with the individual who has to take these into accoutn and pay tax at the end of the year, as per calculation. i agree with the spirit of the article and confirms that we never see big picture. This also reminds me of ‘Rich Dad Poor dad’ that an entrepreneur/ investor are at higher levels by virtue of structure. I think only concern is that unlike developed countries where basics of health, infrastructure and education are far better than what we have in India. So it is matter of value we are getting form the price we pay. However, things have been improving (irrespective of who is in power) in my personal experience and observation. Responsibility remains collective and hence I feel fundamentals are still good for long term growth in India. So LTCG should not be deterent for our investing. PITY! The MPs and MLAs salaries are going up and up with absolutely no meaningful contribution to the country. Their salary does not match the amount of contribution for country’s benefit. On the contrary many are a blot on India’s reputation. They definitely have several other sources of income. Whereas there are many people in the middle class who are just about surviving or managing their living on interest earned or dividend or stocks gathered with peanut money long back. With the current Government strategies middle class is finding it more and more difficult to fend reasonable standard of living. All their life they paid tax honestly and are paying even now. Business man has several methods to hide real income. Only marginal income earned by them is taxed. SO WHO ID SUFFERING? Time to take a note of it as 2019 is approaching! Manish, You always keep it simple & clear :D. I was waiting for this post and I feel my wait is worth now. Thanks for penning down your thoughts. As told by you, I wont touch my portfolio and will wait for your detailed article on LTCG as well. Thanks for your comment Keerthi .. Please keep sharing your views like this..
Each one of us have some different thinking directions but one thing is sure that neither any budget nor any government will change the situation of Middle class people though these people are paying some more tax from income, shopping and now from investments. Either poor can change their class from lower to higher or higher class will goes to highest. Middle class still remain at middle class only.How to change? Thanks for your comment Vaibbhav .. Please keep sharing your views like this.. Though the anguish seems genuine, one has to live with it and it is a given. Once this is accepted, one can think of ways in which one can reduce one’s tax incidence depending on one’s circumstances. I was in same boat for so many years. When I took charge of my wealth, on research many hither to unknown opportunities(unknown to me) opened up. Also financial planning is not static and one can not copy paste from someone else. One needs to understand one’s circumstances fully and take appropriate action so that it can give best result. Also, many books and articles freely available on net are written for newbies and are not tailor made for every body. But once this discovery journey starts, it becomes very interesting as one progresses. Thanks for your comment Srinivas .. Please keep sharing your views like this.. If dividend distribution tax @10% is deducted on dividend payable by the MFs then is better to go for growth option instead of dividend option as the gains are distributed in both growth and dividend options? Is it so? pl confirm as growth option is not dividend and hence not deductible under DDT. No , its a myth . In dividend option its just taken out of same fund and given to you. In growth option, its not taken out and you will pay the tax when you redeem it. Please re- check. There is no dividend collected so there is no DDT applicable. What one will have to pay is LTCG when u file ur return. DDT will not be deducted. Yes, In growth option, there is no dividend … So no question of DDT. But when you redeem your funds, there will be 10% tax. So in both cases, you get deduction of 10% on the money you get. Both are same options ! Are you advocating u pay income tax and cap gain tax? Not possible Manish. Please please recheck. I am confident you are wiser than me. Have read your interpretation dated 11th Feb. As there is no reply button below it am starting a thread underneath the main reply. I am terribly confused. If what you say is a learned opinion please explain how can one avail of 1 Lac LTCG exemption if MF will deduct tax @ 10% redeem, and pay the MF holder. Mutual funds will redeem 10% only on the dividends payment, not on your redemption. Incase you choose dividend option in mutual funds and some dividend is declared and paid, only and only in this case 10% will be deducted and rest will be paid to you. In this case the 1 lac limit does not come into picture. I hope its clear now. If not, please let me know with some example ! I do not agree , i have never gone to see movies in theater since so many years In India ,neither my family orders any dominos -fominos I am a real middle class person ,The vegetable venders ,what you call them in reality are not follwer of Mahatma Gandhi too , they will throw vegetables in dump but will not sell at a lower price even if it starts rotten. who are real farmers in this country politicians ,film actors , corporates , sugar lobbying dalals ,they are really enjoying backdoor agriculture not the grass root level farmers they are doing real work and do not get anything . The recent data shows that the disparity of money between big corporates and average indian is huge as corporates are holding 58% of wealth is this good economy or good indicator of country’s health ,you economists always look at finance and development ,never talk about health and education sector ,which has been neglected in this country and on the contrary its very much important for growth ,look at europe ,north americas , where do we stand and neglecting this the share of these two sectors has been decreased in the recent budget . Salaried middle class is ,has and always been neglected by all govts. whether it be congress or BJP. Housing projects are mosly for low income groups ( influencing vote politics) ,in the eye of govt. middle class have no problems they never strongly resists . Just give u an example how govt. are cheaters for salaried middle class people ,look at the lag between announcement of pay commission and actual implementation done it takes years for implementation ,untill either the next pay commission is knocking at your door or in many cases even beyond that , the benefit is received after 10 years of announcement. None of the govt. has focus towards restricting population of india , which will take over china , the resources of the mother earth are limited its not infinite , whatever you try to increase growth rate ,you will never achieve it until u control population . Thanks for your comment gurudutt .. Please keep sharing your views like this.. I have gone through the points raised by Mr. Patil, who has tried to arouse the middle class salary earners. But, here I want to remind him, why did not he touched our Netas( MPs and MLAs), who have anonymously agreed to raise their salaries and perks beside the fact that around 90% of them are very wealthy and rich enough to sacrifice the subsidies( canteen, air and railway travel and so many other benefits). Of course, I also have respect for some of them, who have not amassed wealth during their tenure. If our politicians are always expecting more and more from the exchequer ( being extremely rich), where is the wrong, if a middle class salary earner expect something from the Govt. Serving for the entire life, he is hardly left with any savings and becomes dependent on his wards. I think this should be considered by every one. Thanks for your comment Lalmohan Patnaik .. Please keep sharing your views like this.. Totally disappointed. LTCG tax exemption on equities played a major role in increasing retail investor participation in equity markets. Despite this, the proportion of retail investor segment remains dismally low when compared to advanced economies. With the reintroduction of this tax, equity investing will become less attractive to the retail investors, thereby slowing down the shift of household savings towards equities. Instead, increasing the holding period for claiming LTCG exemption from one year to threee years would have yielded better results. This would have promoted long term equity investing and generated higher revenues through short-term capital gains tax. Govt want to take away all tax free investment options. I would not be surprised if tomorrow Govt of India makes investment options like PPF and Sukanya Samriddhi Account maturity amount also taxable. I don’t understand what they want to prove, on one side they are hugely promoting investment in equities, on the other hand they are demotivating small middle class investors, by imposing taxes. How are you going to change your strategy now ? I mean , Are you going to decrease your allocation in equity and move to debt? This may not force me to come out of equity market, but surely it will be difficult for MF advisers or Brokers to attract new retail customers. Until now, their punch line “No tax on Income you earn by investing in equity” was very attractive for new to market. This may lead to less investment in market and overall low performance (May be small fraction). And this will lead to my less earning from stock market. Yes some impact might be there. . but not major impact I think ! How will LTCG affect SWP (monthly) from Equity, Debt & liquid funds? When you do SWP from equity, then its redeemption, so if its after 1 yr, the tax will be 10% on the amount you redeem. For debt/liquid , the same .. the taxation applies as per debt fund laws ! This was a disappointing budget. Specially LTCG, govt should think of passing benefits to taxpayers first and then to the other sections of society. I really didn’t like salary enhancement of govt. Dignitaries, are they really in need of that?when they don’t pay tax and avail all subsidies. And specially MPs. Can they all come forward and leave subsidy? It will never happen, these politicians fill their pocket first, above table and under table as well. And 80% of them are crorepatis. Thanks for sharing your views ! Hi I wanted to share a snap but there is no attachment option here. Sorry, you will have to upload it somewhere and provide us a link ! Is the LTCG tax (10%) deducted at source (fund house) when we sell the mutual funds or should we disclose and pay while filing returns? We need to pay it from our side and then file the returns. In case of dividends only it will be deducted at source ! You might want to revisit Sr. no. 6. Why ? Is there anything wrong ? Yes, I corrected it . Thanks for pointing it out ! No interest on Deposits up to Rs 50,000 for senior citizens. Your article is extremely useful. Many thanks. I just need to understand one point about interest income for senior citizens for next FY. If a senior citizen 60+ relies only on interest income from bank deposits, can it be assumed that his tax free limit will now be RS.350000 ? Yes, you are correct !
. It’s still now clear if the employer contribution will also be extra other than govt contribution. => You may need to correct ‘now’ to ‘not’ in Point 11. That was awesome presentation in a nut shell. I disagree. Overall focus of budget is good for the country. Raising IT limit to 300k would have meant a benefit of 2500 only. We should demand the exemption limit is raised to 60 Lacs as MP require that salary as per new budget to live their poor existence in an industry where they choose to serve as their heart is in service of “POOR”. That service provided by Ministers (Servants – meaning and definition of Ministers) should come free out of love for “POOR”. Falling prey to brainwash is only or Gullible. Can you recheck and clarify about your point #7:”No TDS for deposits for Senior Citizens” ? Going through the budget document, it appears that only the threshold of 10k for exemption from TDS has been raised to 50k. Seniors have not been exempted from TDS altogether. Yes, you are correct. I think I made a mistake. I have corrected it in the article ! Many BJP supporters are slamming the “Anti-middle-class Budget”. Congress and Communists will anyway rubbish it. People keep harping about the “Salaried Class” getting nothing while the poor and the Corporates benefiting. I am middle class, I am salaried class and I see no wrong in what the budget wants to do. I am not an Economist but when everyone is acting like one, I believe I too can express what I believe. We are the “most selfish and most stupid” middle class in the world. We bargain with the old lady selling corn to save 5 to 10 rupees and pay 275 rupees for a packet of popcorn in the cinema hall without complaining. Often, they won’t return that 5 rupees change and we ignore that. We harass our vegetable vendor and take free toppings of chillies or coriander leaves and then pay through our noses for the toppings on our Pizza in the upmarket restaurant. We want world class facilities but we need them for free. We look at poverty and blame the governments. Then we refuse to pay the deserved daily wages to our domestic help. We don’t bother about the prices of the liquor but the medicine prices make us protest and blame the Doctors. An entire essay can be dedicated to the selfishness of our salaried middle-class but let us leave it there. An economy is bound to stagnate when the middle class is selfish. Years of Mai-Baap governance has turned us into the most unproductive middle class in the world. Let us take a look at the Corporates now. There is a grouse that the Corporates have benefited by reduction in tax. Are they a pampered class in reality ? If that is true, why have several industries and businesses suffered heavy losses over the years ? A simple truth is Corporates create jobs. Even small scale industries and businesses create jobs while salaried middle class just offers labour. If Corporates and businesses don’t flourish, jobs will be lost. A Corporate or business house creates infrastructure, provides jobs, manufactures goods, pays different level of taxes and sustains economy. Salaried class does none of these. The taxes they pay come after deductions and allowances. Most of the salaried class takes absolutely no risk. They don’t have to take huge loans and repay them. They don’t have to pay salaries to employees. They don’t have to mortgage properties to run an industry. They don’t have to worry about their properties being attached by banks in case of default. In short, the salaried middle class has the lowest risk in the building of a society and a nation. Let’s us now take a look at the farmers. The farmers risk their hard work, money, lands and everything with hopes of satisfactory if not bumper crops. Bad monsoon, poor yield, unseasonal rains and several factors can destroy the crops and the lives of farmers. Even farmers create jobs like the manual labour and other jobs. They produce what we eat. They risk a lot more compared to the salaried middle-class people. This is why I believe, the salaried middle class has no moral right to crib about getting nothing, while pointing fingers at farmers, Corporates and business houses. The risk takers, the investors, the innovators and the job providers should and must get higher stakes and higher benefits for an economy to flourish. A salaried middle-class person demands jobs from the nation while the risk taker entrepreneur provides the jobs on behalf of the nation. A farmer is taking a risk. A Corporate body is taking risks. A business house is taking risks. The daily wages workers have their own insecurities and risks. Unorganized labour force faces hardships. Of all the classes of people, the salaried middle-class is the least risk facing class. They know the cheque or RTGS will be ready by the end of the month. They know exactly what will be their income and have that advantage to plan their expenses, savings and holidays accordingly. The salaried class believes, Arun Jaitley has hit them hard. But the reality is that most governments have treated the salaried class with kid gloves because they have unions and they are vote banks. Those who change cars every 5 years, smartphones every year and can afford flying to different destinations as part of Corporate meetings forget the simple fact that someone sitting at the top of the organisation is funding the journey, air-conditioned comforts, the alcohol, the five-star dinners and even the taxi fare. It is time the people woke up to reality. The salaried middle-class must grow up. They get their jobs, salaries, perks, food, shelter and everything else because the Corporates, business houses, farmers and workers are taking the risks. Unless a system doesn’t reward the risk takers and entrepreneurs, the economy will never flourish. For the first time, we have a government that is taking the middle class bull by the horn. The bull has to understand it isn’t a cow and can’t produce milk. A Pakoda seller is creating jobs. A barber who rents a shop and starts a saloon with 3 or 4 chairs is creating jobs. Pakodanomics is used as a derogatory term by the left and the Congress camps. These are the same people who talk about dignity of labour and quote Amitabh Bachchan’s “Koi Kaam Chhota Nahin Hota”. They know nothing about entrepreneurship and that is why they talk about jobs, jobs and jobs. There will be no jobs for the less imaginative, risk-fearing and job seeking people if the entrepreneurial Pakodanomists don’t take risks. Yes, the tax net has to widen. High end agricultural income too should be brought under tax net. But that can be done only after making the life of the average farmers a lot safer than what it has been. Reforms is a continuous process. If we want to be a developed nation with world class amenities, we must stop being selfish. The other option before us is the Mai-Baap governance that throws a few crumbs in the form of subsidies and sops and robs us from the backdoor. We will continue to live with corruption, poor infrastructure, pathetic services and bad roads. I know my choice. It is up to each and everyone of us to decide what we want. Thanks for sharing this .. I agree with these points ! Completely agree with these points. While our immediate reaction could be of disappointment, thinking logically tells you that the govt is trying to avoid more losses because of these tax rebates. Tax net is increasing with every Income tax officer being given target of adding 75000 new increasing IT payers every year. This info is from my close relative and may be different. This country needs reforms big time and these reforms do take time and some sacrifices. Paying a little more IT won’t hurt me much and I think we can still make and save good money within these new IT rules. It’s upto us to make sure we plan well, use the rebates well and make good investments. Thanks to Jagoinvestor for ideas. Agree to your points ! Very well written Mr Patil.